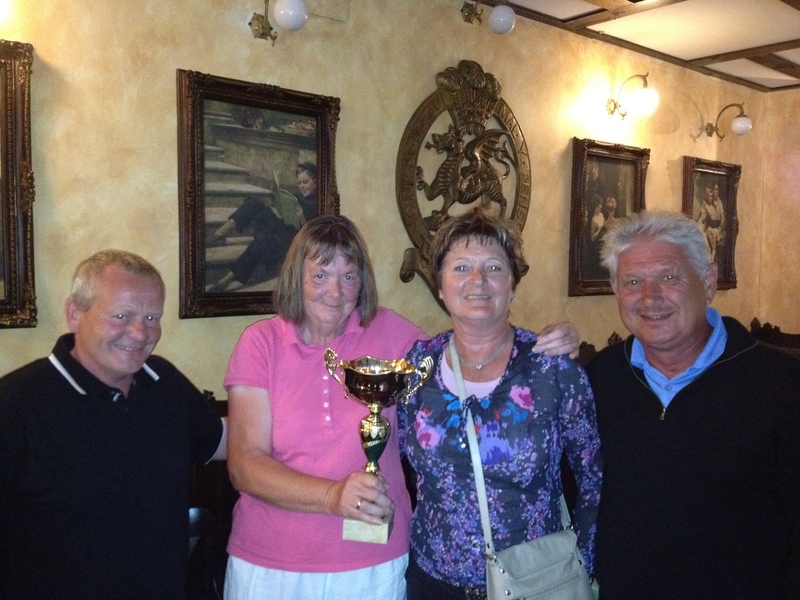 Lis and Astrid receive the cup from Kev and Barry……………. After two weeks of individual stablefords and another one due this week (blind pairs) the committee decided to change the format from that published in the diary. This became a pairs matchplay competition between the tigers and rabbits (1st division v 2nd division). I think everyone enjoyed the format where a bad score on the last hole could be forgotten – just make sure you win the next hole! It was a closely fought contest with the the tigers coming out on top by 7 matches to 5. Lis Jakobsen and Astrid Spieler were chosen to collect the annual trophy on behalf of their team (see photo). Thanks to Julie Simpson for taking the pictures. 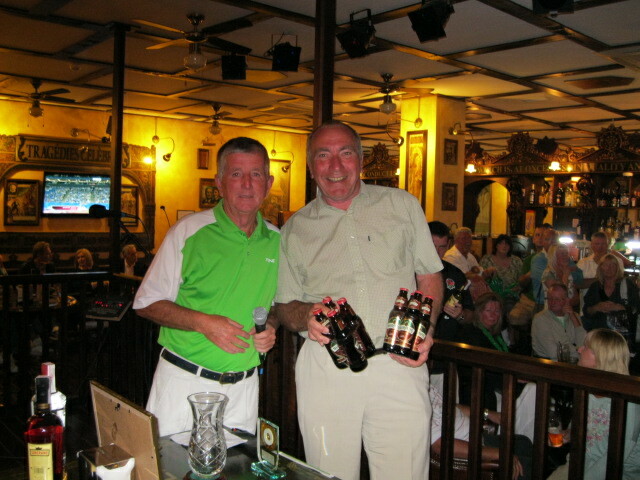 Neil from the Clover has donated a prize each week for any player getting a two. 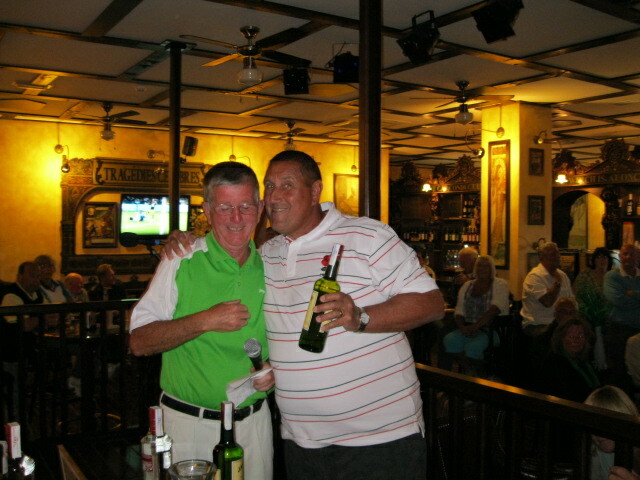 This week Paul Culligan (17th) and Scott Abraham (11th) were forced to down a very generous shot (alcoholic!) of Neil’s choice in one. We later discovered that Paul Briggs also had a two (7th) but he was quite happy not to receive his prize! 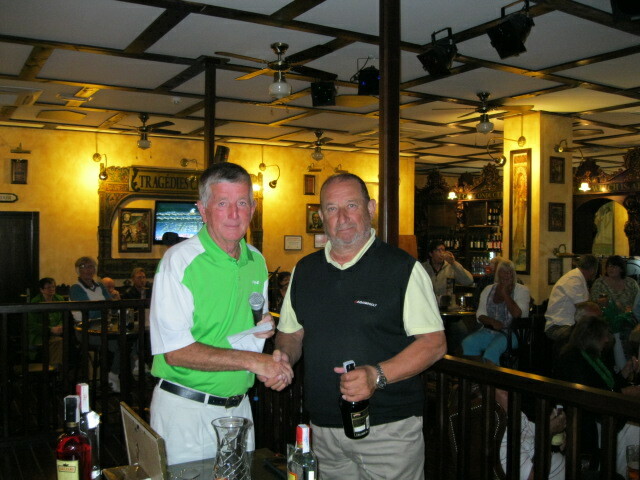 Next week is the 2nd major of the year – the Graham White Pairs Strokeplay event. Partners will be drawn at 8pm next wednesday night in the Clover. Tickets for the evening presentation (at the Condado Club) are available from Cath at 12 euros.These are only for sale until wednesday night. Included is a hot/cold buffet, raffle tickets and live entertainment with El Tel. We are spoiled for choice now with the Condado Club, Clover and the restaurant open and we will try to support them all. At the end of April our course is closed for 3 days for hollow tining so we will be playing our bi-annual challenge match against Mar Menor golf society at Mar Menor. Prices will be society and course member rates (the same as at Condado). Planning for the Seve charity golf day on May 11th is progressing well with a very good response from members, non-golfers and businesses with offers of help and sponsorship for the day. Each hole will be sponsored at a cost of 20 euros and already 14 holes have gone. The Seve collection jar in the Clover is filling rapidly, and with entry being free for the competition today many put their 2 euros into the jar. Again on the theme of the Seve charity and an awayday, Aguilon golf are staging their own charity day in aid of the fund Sunday April 29th). They have promised to support our day in some way. The cost to enter their competition is 35 euros per player which will include a buggy. 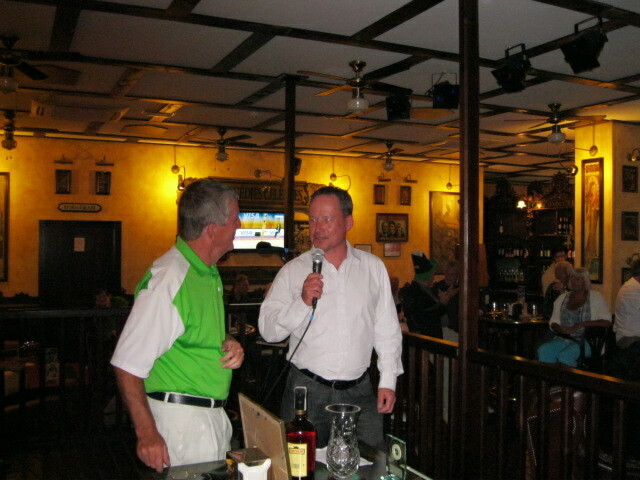 The organiser has promised to donate 20 euros from every entry to the Seve Foundation. We will post a list and hope to get a good response for this worthy cause. Anyone who has not experienced Aguilon yet will be impressed with their very interesting course. We have several unclaimed prizes. If the above players can contact us we will save them until a specified date, otherwise we will keep them until April 30th 2012 and then put the unclaimed prizes into the collection for the Seve foundation. No more nominations for the posts of secretary and social secretary can now be accepted as the closing date was March 30th. This will be dealt with at the EGM (April 12th 7.30pm in the Condado Club). Following the death last year of the legend Seve Ballesteros (on May 7th) we decided it would be a fitting tribute to introduce a major competition into our calendar to be played for annually to coincide with the anniversary of his passing. Last year we made an immediate decision to donate all entry fees from 2 weeks competitions to the Seve foundation (which is for research into brain cancer). However, within the same week the terrible earthquake in Lorca decided us that Seve would have preferred our collection to go to the Lorca relief fund. The committee matched money raised and we were able to give the fund 300 euros which was a marvellous response in such a short time. Our thanks go to all the members who contributed. This year we have had time to plan the event, and hope to make it one of the best days of our golfing calendar. It will take the form of an individual stableford and will take place on Friday May 11th. A sub committee has been formed (Brian Yeldon, Paul Briggs and myself) to formulate a course of action which will promote the event and decide how best we can raise the maximum amount of money to go to the Seve foundation. The members of the committee will approach various local businesses for sponsorship. Donations from any individual will also be welcomed. Thanks to Neil From the Clover for his input and sponsorship and putting the Clover at our disposal. After much discussion the entry fee has been set at 5 euros – hopefully the members will not mind this as it is our only charity event of the year. However, to give value for money this will include free entry to the post match putting competition on the practice green; nearest the pin; longest drive; 2’s sweep; members free draw. We already have recruited our main sponsors golfdealers, an online golf equipment retailer(http://www.golfdealers.co.uk) They will also offer a 10% discount on any purchases to our members. 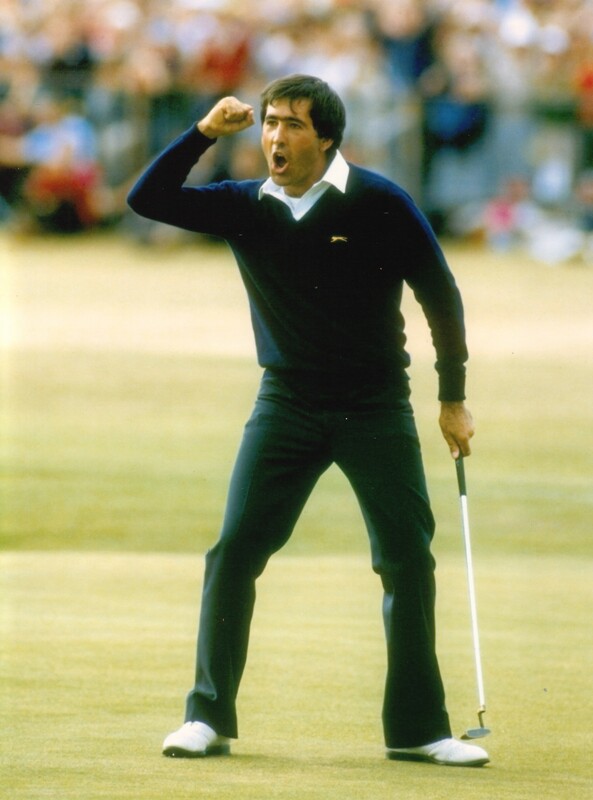 They have purchased the main trophy and replica which will be a framed photo of Seve at his peak, celebrating his Open championship win on the 18th green at St Andrews. (The winner will get an exact replica of the main trophy which will remain with the society). Also we are asking for sponsorship of each hole. This will publicise the sponsors name at each tee. At a cost of 20 euros we already have 7 takers. From this one of the main fundraisers will be an auction of the more valuable prizes. We have already arranged the evening event – the prize giving will be in the Al Kasar restaurant at 19.30 following which members can book their own table/meal. The new proprietors are from the Bulgarian restaurant in Camposol and the restaurant re-opens on April 1st (no kidding!). Mark has already offered to sponsor a hole and has donated a voucher for a meal for 2 for the auction. 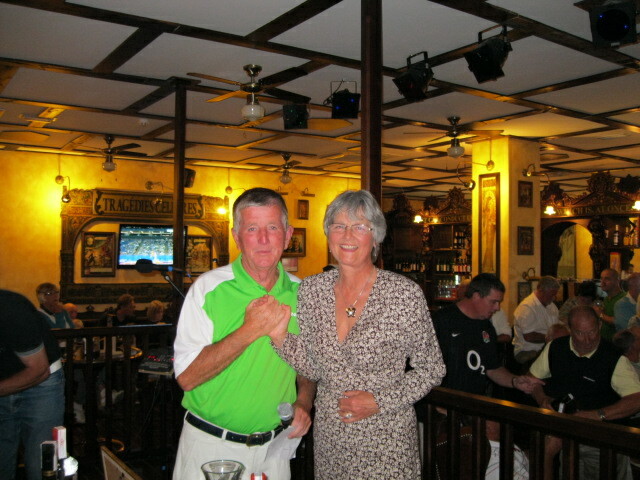 Then at about 21.30 we shall go to the Clover where there will be entertainment provided by Neil and Lynne. In the interval the highlight of the night will be the auction, which should raise a significant amount for the charity. Neil has already started the ball rolling with a collection jar on the bar. There will be a raffle on the night and probably a bucket for you to throw your holiday money in! Brian and Paul have introduced a 50 cent fine for any player going in a designated bunker each week up until the event, the location of which changes on a weekly basis (info given with your scorecard). Profits from the weekly domino card run by Cath & Kev will also go to the fund over the next 8 weeks. Last week Ian McAdam won 2nd prize in the golf but had to return home before he could receive the cash prize – he has told us to put it in the fund – a very nice gesture! Drinks and hopefully home made cakes will be on sale at the 12th tee at 1 euro each. Hopefully players will take time out to have a little break and contribute to the fundraising- Sue and Brian will gladly take your money! The society will donate an amount to the fund (to be decided) but will be unable to match money collected this year – it is expected to be a significant sum! Brian and Paul are in discussion with Global Golf who will provide sponsorship and hopefully act as intermediary with the Seve Foundation who apparently don’t speak english, but they should be able to provide advice (and possibly advertising banners etc?). Neil is talking about a weekly lottery draw (as we used to have in busier times) and a grand national sweep. Lots of ideas and initiatives there – if any member has more ideas or can help it would be greatly appreciated. We have already had offers of help from both golfers and non-golfers which is much appreciated. I will update you with news and developments as they happen. Next week is the tigers v rabbits pairs matchplay competition (pick your own partners/times). The following week is easter (good friday) and is the 2nd major tournament of the year. The Graham White pairs strokeplay will be drawn out next wednesday at 8pm. The presentation will be at 8pm in the Condado Club, with tickets costing 12 euros. Included will be a hot buffet, raffle tickets and entertainment with El Tel (who sang for us at the 1st Viking Cup night at Trevis). for the Seve Trophy charity day to be played on May 11th. highlights of our golfing calendar. I will give Hacienda del Alamo a plug here as they have been so good to our society. Next Thursday sees the inaugeration of the academy. 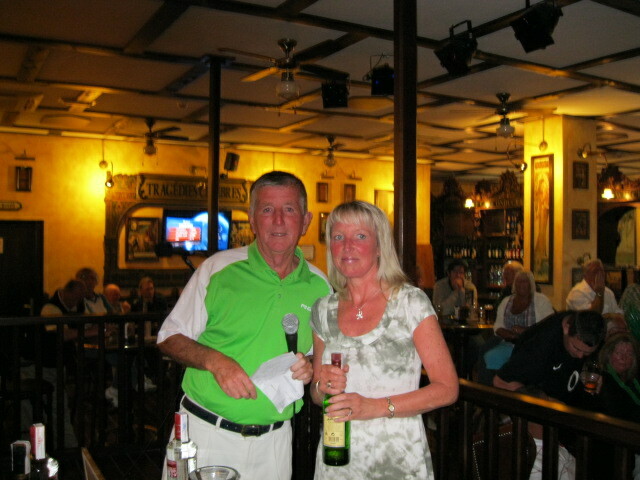 For 20 euros there will be putting and chipping competitions and a competition on the 6 hole course. This starts at 10am on Thursday March 29th and is followed by an included barbeque, market and live music from 14.30 to 19.00. 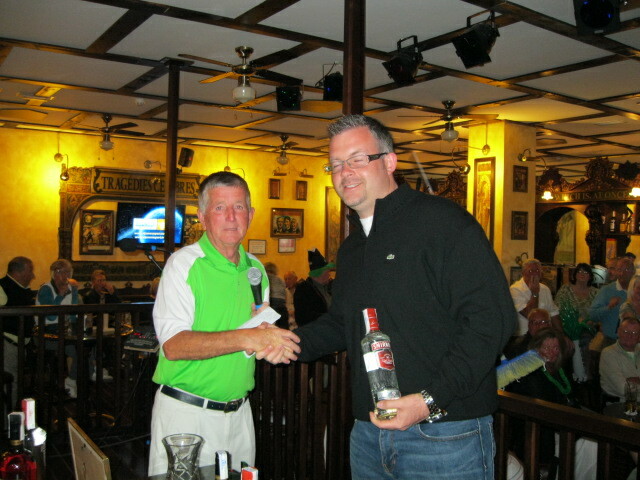 The annual St Patricks Day event took place on Saturday with 38 players taking part. I am sorry that I cannot report as much information as usual, but I was in Valencia for the annual celebration of the fallas, which was a great day out. There were many super scores in comparison to the previous days results in the usual Friday society competition and many players woke up on Sunday with sore heads from the night out and a lower handicap! 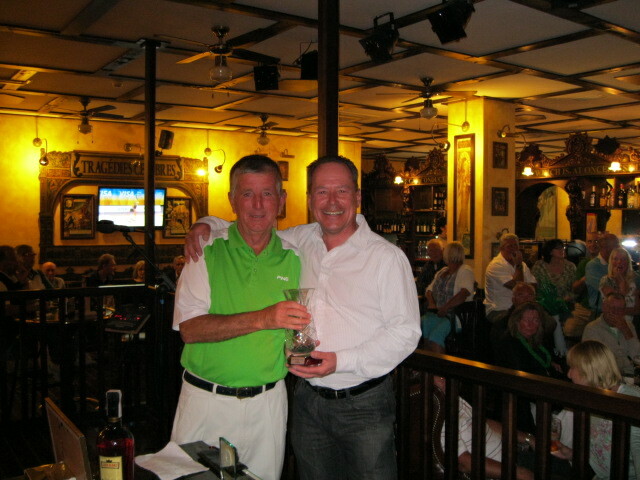 Thanks to Fred and Bernie Twomey who supplied the trophy and prizes, which tended to take the form of irish liquid! 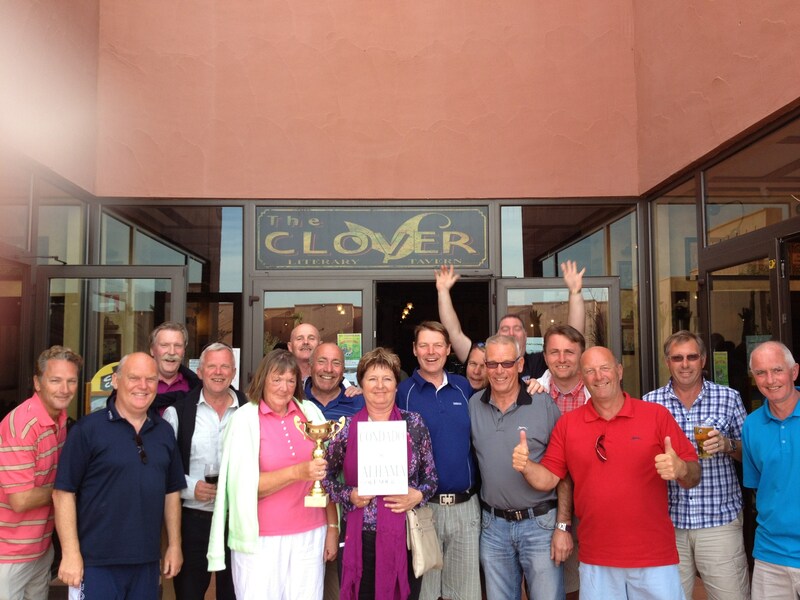 Also thanks to Sandy Simpson for providing photos of the presentation in the Clover. After the golf many joined in the theme of the Irish day by watching the Ireland v England rugby match in the Clover – sorry about the result of that Fred! This was followed by a party with many guinesses being downed! This week was an individual stableford. As it clashed with the St Patricks Day event (Saturday) numbers were down with players generally electing to play either Friday or Saturday. Still we had 27 players which allowed 1st and 2nd prizes to be awarded in the 1st and 2nd division categories. The sub-committee for the Seve Trophy have already started formulating ideas for May 11th. Our 1st fundraising event was the introduction of a penalty fine of 50 cents for anyone going in a designated bunker. This week it was the right hand bunker on the 3rd. This nominated bunker will change each week and players will be informed when the collect their cards from Brian in the car park. We have another meeting this week so more info should be published in next weeks blog. The domino card was held over until Saturday due to lack of numbers at the presentation. Next week will again be an individual stableford (last Fridays individual was not scheduled). As the following week (March 30th) is down as a blind pairs event (basically 2 individual scores drawn together) the competitions team have decided to change the format and introduce another fun challenge based on the Captain v President competition. It will be a pairs matchplay event between the Tigers and the Rabbits. We will take names on a list and on Wednesday at 8pm we will divide entries into 2 teams by handicap order. So the cut off point for each team is not set in stone – normally tigers have handicaps 15.4 and below and rabbits 15.5 and above (before slope allowance). So this cut off point will depend on where the mid way point is from the entrants. The rules will be matchplay – 2 players on each side. Winning team gets one point, halved matches half point each. Again this is a fun comp with a bit of ‘needle’ involved! Minutes from the AGM will be published on the noticeboard and this blog. Please note an extraordinary meeting has been called for Thursday April 12th at 7pm in the Condado Club. This is to vote for the 2 committee vacancies (secretary & social secretary). Nominations must be in to cath@cdagolf.com by March 30th. Also please note that membership is due from March 1st 2012. This will run until March 31st 2013 (13 months) as agreed at the AGM. Some members believe that 2011-12 had been extended until March 31st this year – that is not the case. It was stipulated that any member from last year could attend the AGM and vote. This week was a 4 person team event with 2 scores counting on each hole. It produced a good contest with one point separating the top 3 teams. There had been some verti cutting done on the greens, with fine sand covering the grooves, but the greens were fast and true. Also fertiliser has been spread over the deep rough areas (what a stink!) so the rough should soon be waist high again! Also staff have been busy planting more ornamental grasses (but this time in the deep rough areas?). Still no sign of the temporary clubhouse moving – suspect the delay is due to RMI not releasing the money to carry out the necessary work. Roll up meetings and presentations will now be at the Clover bar. A great opening might last night with a good band (at the civilised time of 9.30pm), free food and a great atmosphere. As predicted service was quick and friendly. With the next door restaurant opening on April 1st the Al Kasar will come alive this summer! Next week is an individual stableford on Friday, but an additional tournament will take place on Saturday. 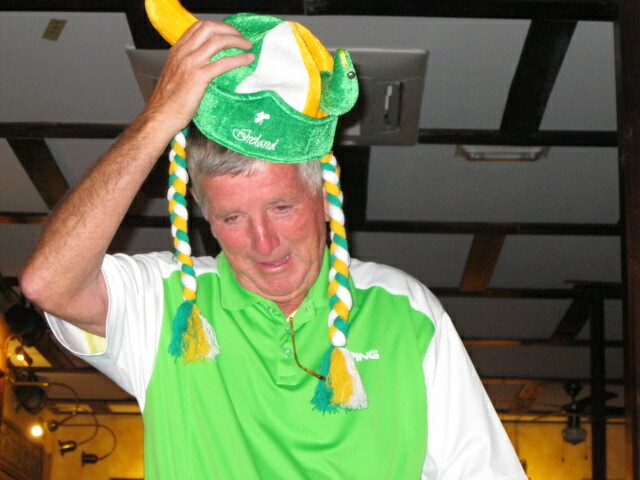 A St Patrick’s Day stableford will take place (times 09.30 to 11.30) followed by a party in the Clover. In between there is the rugby union match between Ireland and England so the Clover should be buzzing at teatime! Membership is now due and cards are available from Phil on Wednesdays and Fridays. This will now run until March 31st 2013 so members will get another month gratis(this is so membership will be current at the next AGM in March 2013). There will be an EGM (extraordinary general meeting) in the Condado club on Thursday April 12th (7pm for 7.30pm start). This is in response to interested parties wanting to apply for the 2 vacant posts on the committee (secretary & social secretary). As no one had volunteered by the 2 week deadline before the AGM, nominations could not be accepted at the AGM as that would have breached the constitution rules. As soon as the AGM minutes are available I will post more details about this. Global Golf have now introduced a 3 euro charge for insurance on top of the green fee. This has been enforced by the spanish golf federation who had a major claim last year after the death of a golfer. The cost of membership of the federation is 72 euros annually, but obviously this is too much for a casual visitor. If you have insurance purchased in your home country evidence of this will be needed to avoid the 3 euro charge. George Hoskins has found a company giving good value insurance for about 32 euros annually and you can see information at http://www.eyeonspain.com Condado de Alhama blog. This week is a 4 person team event.